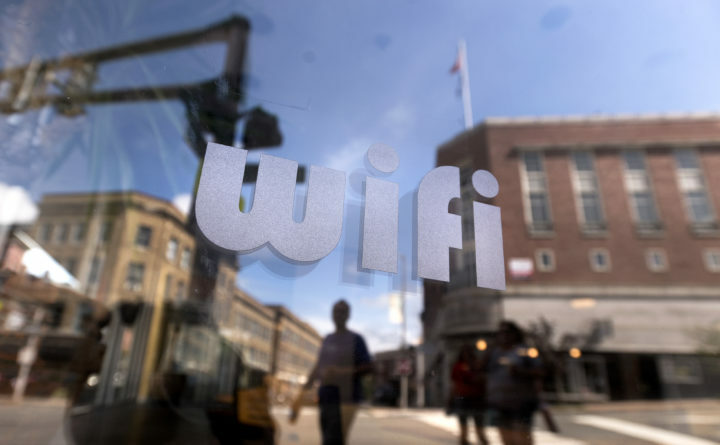 A business advertises WIFI access in downtown Bangor. City officials declared broadband an essential infrastructure Monday night, just like water, sewer and electricity. This declaration is the first step in making a financial investment to build the city's own fiber optic network. Maine’s third largest city is considering investing its own money to install high-speed, citywide broadband, which would slash service costs and increase internet speed for local users. Bangor city officials Monday night declared broadband an “essential infrastructure.” The gesture is largely symbolic, but it’s a necessary first step should the city choose to invest in the actual idea, Community and Economic Development Officer Tyler Collins said. If Bangor chooses to invest and construct new fiber optic infrastructure, it will become the largest city in Maine to provide broadband as a public utility. If it’s built, the city would collect a utility fee from residents to maintain the broadband system, just as it does for maintenance of city stormwater and sewer systems. Customers would additionally pay the internet service provider directly for access to the internet. Still, Conlow said, it’s not yet a sure thing. “We’re really just exploring,” she said. Eric Conrad, director of communications and education services for Maine Municipal Association, said Bangor’s mindset, even if its preliminary, reflects a trend across Maine that’s gaining momentum. Too few residents paying for the service or poor management of the network once installed are probably the biggest risks for a publicly maintained broadband network, said Heather Johnson, executive director of the ConnectME Authority, which is administered by the Maine Department of Economic and Community Development. City officials will put out a request for proposal, and continue researching the plausibility and cost of the project in the coming weeks.